Own gold that you don’t use anymore? Here’s how it can earn some money for you. When the Gold Monetisation Scheme was introduced in 2015, stocks of gold in India were estimated to be over 20,000 tonnes. But the surprising part is - this gold was neither traded, nor monetised. Hence, the basic aim of this scheme is to monetise all the gold which is lying idle with individuals or institutions like banks. If you too have some idle gold, here’s how you can earn from it. This scheme provides you with a gold savings account where you can deposit physical gold – jewellery, coins or bars – and earn interest on this gold. This interest depends on the weight of gold and the appreciation in its value. However, note that you cannot deposit gold jewellery which has embedded stones. You are required to take your gold to any government authorised Collection and Purity Testing Centre (CPTC). CPTC will then carry out tests on your gold and verify its purity. Once determined, an official receipt for the gold quantity and quality will be provided to you. After you submit this receipt to your bank, they will issue a final deposit certificate to you. This certificate will contain all the information related to your deposit. The agency or bank will ask you fill your KYC details and submit them. The minimum lock-in period for your gold savings account is 1 year. You can deposit as little as 30 grams of gold to open the account. There is no upper deposit limit. Short-term: Earns you interest in the form of gold in grams. For example, if the interest is 1% per annum, you will get 1 gram on 100 grams, therefore 101 grams in total. Medium-term and Long-term: Earns you interest in the form of Rupees with reference to the value of gold at the time of deposit. For example, if you deposit 50 grams at a value of Rs. 1,50,000 and 2.5% interest rate, you will earn Rs. 3,750 as interest per annum. At the end of your account’s tenure, you can choose to redeem your gold either in physical form or in equivalent cash. You will be asked to specify your preference when you open the account. In 2016, the Reserve Bank of India made premature withdrawals possible for medium-term (5-7 years) and long-term (12-15 years) government deposits after completion of the minimum lock-in period - 3 years for mid-term deposits and 5 years for long-term. This will attract a small penalty, in the form of a lower interest rate. Why should I open this account? 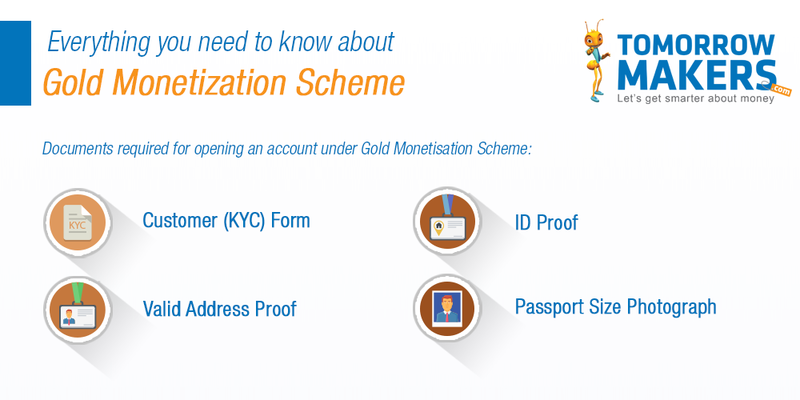 This scheme allows you to earn from the gold that is not in use. Your gold will be safe with the agency/bank. The rate of interest offered by the scheme is between 2.25% and 2.50% per year. Any amount you earn through this scheme is exempted from income tax. Capital gains too are exempt from taxation. India’s love for gold is no secret. But most of still view as a thing to be kept in a locker and probably worn occasionally. However, why let your gold sit idle when it can keep adding to your wealth?